Billed as the “World’s First Smart Spectrometer”, the Asensetek Lighting Passport made its first appearance at ProFusion Expo earlier this month and seriously impressed everyone who saw it. 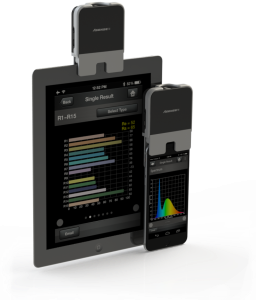 Geared towards anyone who considers themselves a lighting professional, this pocket-sized device pairs a professional spectrometer with most iOS or Android smart devices via Bluetooth, and can accurately measure up to 90 different parameters when using the 4 currently available apps and available PC software. Evaluates, selects & monitors horticultural grow lights. Provides full and detailed information about the TLCI (Television Consistence Index of a specific light source or entire set-up. At 68.5mm by 56mm, with a thickness of 17mm and weighing only 76.5g, the Lighting Passport offers a slim and compact light testing solution. Measures up to 90 different parameters among the different available apps with up to 8nm Optical Resolution, 50~50,000lux Illuminance Range, 380~780nm Wavelength Range and 6ms~16s Integration Time. Supports Android 4.4+ based devices, iPhone 4S, iPhone 5/5C/5S, iPhone 6/6+, iPod Touch 5, iPad Mini/Mini2, iPad 3 and iPad Air. Attracts customers attention in exhibitions and stores with on-site product demos. 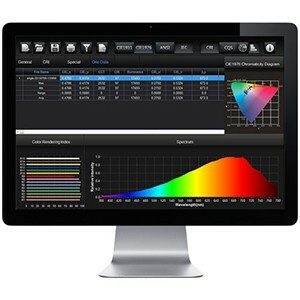 Both versions of the Asensetek Lighting Passport are available to purchase through Vistek. Originally published at Pro Photo Blog.